Have you ever thought about the layout of a room and how that affects the conversation you have in that room? Envision a large board room with a rectangular table. You are seated at the end of the table. Everyone looks to you for direction. The people sitting on the long side of the table can’t see one another and may stay silent since they can’t tell who is speaking and when there is an opening to speak next. Now envision a café with small circular tables that can accommodate three to four people. You can make eye contact with everyone at the table and you are close enough to hear one another. It is a completely different style of conversation. The room layout, including the shape and size of the room,tables, and chairs has a significant impact on how people act when they attend a meeting in that room. Depending on the type of conversation you want to facilitate, you want to give close attention to the room layout. Unfortunately many workspaces do not have a lot of variety in room types. Even if you are limited by typical rectangular rooms with rectangular tables, think about how you can modify the space to create the tone you need for your next meeting. In this video clip, I share a couple of examples about how layout can affect the tone of the meeting and the attendee’s behavior. By changing how you design or modify the space you are in, you can actually have an impact on the outcomes you want to achieve. For example, if you want to increase participation, you can do so by creating a space that allows everyone to see and hear one another and sets a tone of equality (such as a circular table). 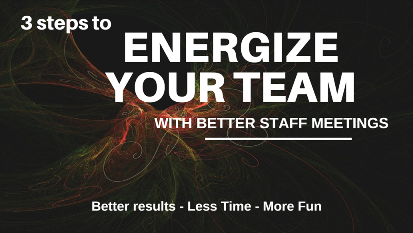 For more ideas of how to improve your staff meetings to increase engagement and improve productivity, download my free toolkit below.